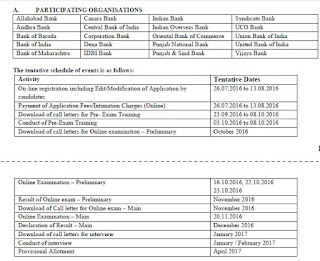 The Preliminary Examination for Probationary Officer posts was conducted by Institute of Banking Personnel Selection on 16, 22 and 23 October 2016. Every year, Lakhs of candidates appeared in IBPS PO/MT Exam for being selected. Recently the test was held at various centres all over India and now the preparation of results is complete. Here you will be notified about IBPS PO exam result 2016 with latest news and updates regularly. The scores of PO Main exam are released in Evening today. IBPS had declared the result of PO Main Exam. 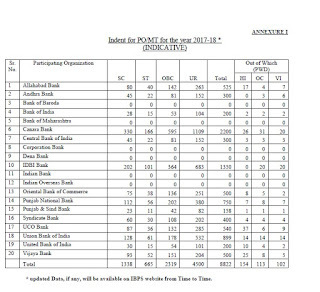 IBPS had released the scores of PO/MT Pre exam. IBPS had announced the result of CWE PO/MT Pre exam. You can check your result status from below link. The selection of eligible candidates is to be done through Preliminary and Mains exam and interview. Here is the original schedule of IBPS PO that will let you be aware of IBPS PO Result date. To check your result, you have to visit the below given link to find your qualifying status. The result of main exam is to be declared on 08 Dec 2016 late evening. To check your PO/MT Mains result, you have to visit the above given link to find your qualifying status. Check Main Exam Result from above link. Check Pre Result from above link. IBPS PO Prelims Result had been announced on 04 November 2016. Those who qualify it, have to appear for Main exam to be held on 20.11.2016. So all those who are confident that they can qualify prelims, should start their preparation for mains right after their pre exam. The score card is available now for Prelims. The result of Pre exam is declared on 04 November 2016. Mains is scheduled to be held on 20 Nov 2016. A total of 8822 posts of Probationary officer / Management Trainee will be filled in 2017-18. Around 35-45k candidates will be called for interview this time which are to be organized in Jan-Feb 2017. IBPS PO/MT Pre Marks declaration - within 7 days after result announcement. Candidates can check their marks secured by them in each section as well as total in the test from above link. 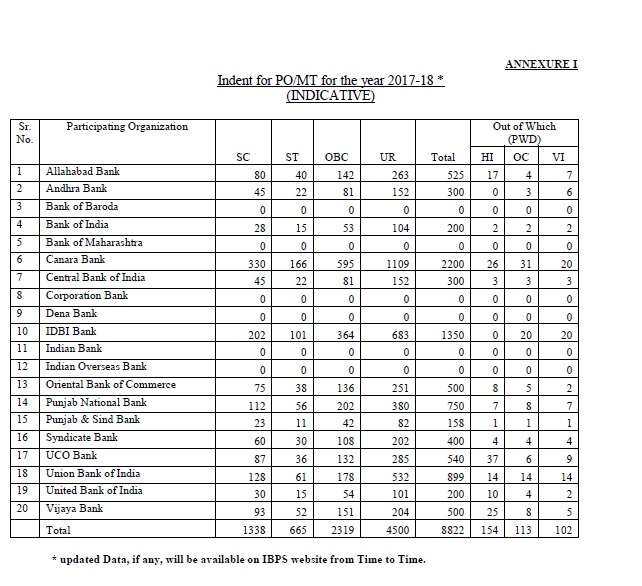 Along with results, Institute of Banking Personnel Selection will also declare the cut off marks for each section and overall. The C.O. marks will be declared for each category separately. Here are the expected cut off marks of IBPS PO Pre 2016 out of 100. In the pre online exam, questions have been asked from English language, Quantitative aptitude and Reasoning ability sections. While English language is of 30 marks/questions, Both Reasoning ability and Quantitative ability are of 35-35 marks/ques. The notification of IBPS PO 2016-17 was released in July 2016 for which applications were to be filled from 26 July to 13 August 2016. After the application process was over, Pre exam training was held for SC/ST/minority candidates from 03 October to 08 October 2016. The Preliminary online exam was conducted on 16, 22 and 23 October 2016. Now the result of CWE PO MT Pre is to be declared in November 2016. After the declaration of Pre exam result, Main exam will be held on 20.11.2016 in which only qualified candidates of Prelims will be allowed to appear. After the Main exam, its result will be announced in December 2016 in which shortlisted candidates for interview will be declared. Interviews will be held from January to February 2017. After all these stages, IBPS will declared the provisional allotment in April 2017. Candidates will be allotted their banks based on their marks obtained and preferences given by them in the application form. The weightage (ratio) of CWE (Main exam) and interview will be 80:20 respectively. Selection for Pre, Main & Interview consists of clearing the cut off marks set by the organization at each step. Those who clears them all, will finally be appointed as Probationary Officer / Management Trainee posts. IBPS may declare the pre result in the form of pdf having the list of shortlisted candidates for main exam or through login. It is more likely that it will declare marks through login where you have to enter your registered no. or roll no. and password or DOB and submit. Then the site will show your marks obtained in each section, max. marks and cut off score. Also it will show your status whether you have qualified for the main exam or not. 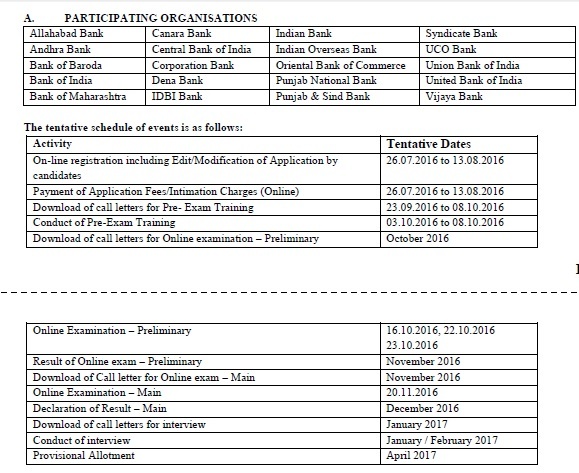 Institute of Banking Personnel Selection had invited online applications for CWE PO/MT 2016-17 in July 2016. To be eligible for registering applications, an applicant should have done graduation from a recognized university. Candidates can apply for this recruitment at official website. Lakhs of candidates appeared for IBPS PO 2016 Pre exam which was held on a span of 3 days. Now those candidates have been waiting for their results / scorecard. After the pre exam gets over, the process of preparing IBPS PO Pre result 2016 is started. Why IBPS PO Main Exam Result marks are important and Pre Exam Marks are not. Pre Result marks will not be considered for appointment or used in determination of merit. Preliminary exam is just for the shortlisted of non serious candidates. Main exam carries most of the weightage. So you can see Mains carry 80 percentage weightage in selection. It means if you got higher no. of marks in Main exam and satisfactory marks in Interview, then there are higher chances that you will be selected. Many candidates who qualify Pre exam, were not able to clear mains because of the competition and level of the paper. Questions in Main exam are asked from 5 tests i.e. Reasoning, Quantitative Aptitude, General awareness with special reference to banking industry, computer knowledge and English language. Competition in Mains is among the qualified candidates of Pre but only those will be able to qualify Mains, who have better grip on above topics. So all those who qualify as per IBPS PO Result of Pre exam, should work hard enough to qualify Mains as it is the most important exam of IBPS PO/MT Recruitment. The following vacancies will be filled through IBPS PO CWE VI exam 2016. Total vacancies in IBPS PO 2016: 8822 posts. A reserve list to the extent of approximately 10% of the vacancies under each category may be kept, subject to the availability of candidates.